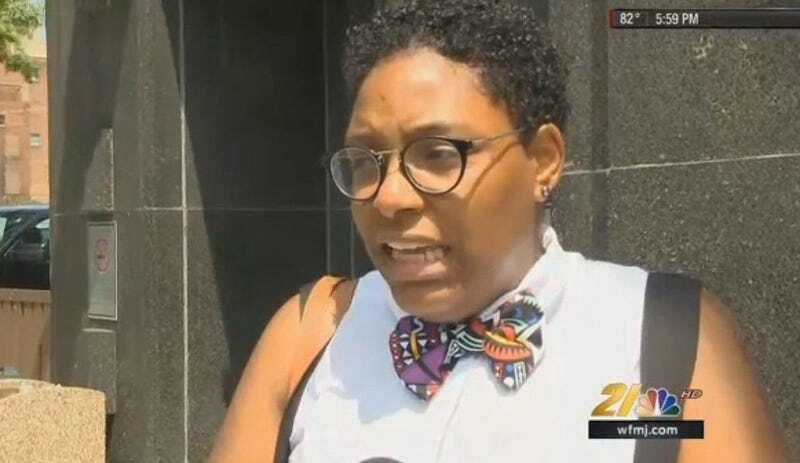 An Ohio attorney was sentenced to five days in jail after refusing to remove a Black Lives Matter pin she was wearing. According to the Washington Post, an Ohio judge had told attorney Andrea Burton that there had been complaints about her pin and that court officials were not allowed to wear political pins in his courtroom. Shortly after once again refusing to take off the pin, Burton was convicted of contempt of court and sentenced to five days in jail. The incident, the Post notes, has sparked a growing debate in Burton's community and around the nation as to whether Burton was merely exercising her right to freedom of expression or whether her pin was, in fact, a political message that was not befitting of a court official. Youngstown, Ohio, Municipal Court Judge Robert Milich told WKBN that his decision had nothing to do with his own personal opinions. “A judge doesn’t support either side,” he said. “A judge is objective and tries to make sure everyone has an opportunity to have a fair hearing, and it was a situation where it was just in violation of the law." Milich has, however, issued a stay in the case while Burton appeals the ruling. According to WKBN, she will remain out of jail during the process so long as she obeys Milich's order and does not wear any items that make a political statement in court. Burton, for her part, said that she works with the police every day and knows that they're not as bad as some label them to be. However, the attorney said she did want to address the recent police-involved deaths of black people in her own way. Youngstown NAACP President George Freeman Jr. issued a statement saying that the chapter would work to "ensure that Attorney Burton's constitutional rights are not being violated." “No one wearing an American flag button, no one wearing a crucifix or a Star of David would be removed, so why this particular statement bothered him so much is bothersome,” another attorney, and community activist, Kim Akins added. “There’s a difference between a flag, a pin from your church or the Eagles and having a pin that’s on a political issue,” Milich countered, saying that his ruling was based on Supreme Court case law that states a judge is allowed to ban political expression from the courtroom. Read more at the Washington Post and WKBN.